Yankee Candle £6.29 / You can't go wrong with a candle this time of year, especially when it has 'Yankee' written on it. I went for 'Fireside treats' because it works both now and after Christmas and is on offer. River Island Faux Fur Scarf £20 / Perfect for any aspiring Chelsea girl- This faux fur scarf from River Island is both a stylish and cost effective way to cosy up this Christmas. Millie Mac would be proud. Bunny Lamp £6.95 / I feel like lots of girls are really into their home decor at the moment and this cute little bunny lamp is unbelievably cheap way of adding an adorable kitsch element to any bedside table. Topshop Lipstick & Blush Set £12 / I knew I had to include at least one piece of make up in this gift guide and there's nothing better than a good Topshop cream blush and lipstick so why not share the Topshop lovin'? Cath Kidston Phone case £18 / This is actually the case I have but I've had so many compliments on it I'm sure it would make a great gift for any Cath Kidston/iphone lover. Eleanor Calder (girl crush!) has this too. Tangle Teezer £10.99 / If the girl you're buying for brushes her hair then you can't go wrong by adding a tangle teezer to her life. These make detangling even the bushiest hair a breeze and they look rather nice too. 'It' by Alexa Chung £11.55 / I love getting a good book to browse through on Christmas morning and 'It' by Alexa Chung is both amazing to read and beautiful to look at/ include in blog photo backgrounds. Win win. LUSH Baby Frosty £9.75 / I was over the moon to get two big LUSH gift sets for my birthday so I'm sure any other girl would be equally thrilled to find this little guy in her stocking with two bath bombs inside. 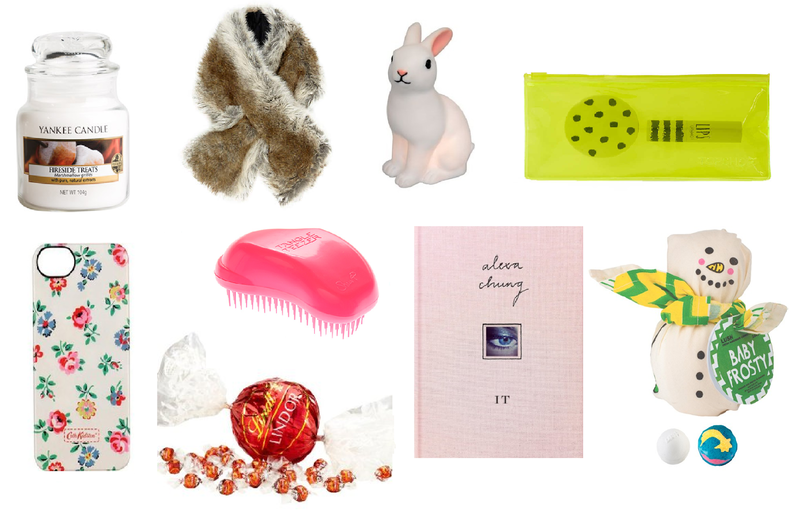 What's on your girl gift guide? Fireside Treats is a gorgeous candle. Also love the bunny lights, so adorable. I have fireside burning on my bedside table, it is a wonderful scent and really fills the room! I've got my eye on the Yankee Fireside Treats candle! I would literally love to receive any of these so perfect!